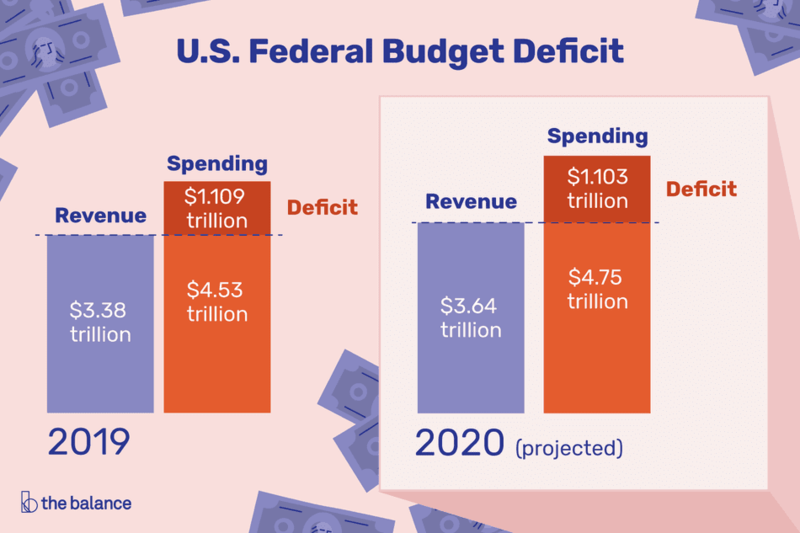 The U.S. federal budget deficit for fiscal year 2020 is $1.103 trillion. FY 2020 covers October 1, 2019, through September 30, 2020. The deficit occurs because the U.S. government spending of $4.746 trillion is higher than its revenue of $3.643 trillion. The deficit is 1% greater than last year. The FY 2019 budget created a $1.09 trillion deficit. Spending of $4.529 trillion was more than the estimated $3.38 trillion in revenue, according to Table S-3 of the FY 2020 budget. Many people blame the deficits on entitlement programs. But that's not supported by the budget. These enormous deficits are the result of three factors. First, the attacks on 9/11 led to the War on Terror. It's added $2.4 trillion to the debt since 2001. It almost doubled annual military spending. It rose from $111.9 billion in 2003 to a peak of $150.8 billion in 2019. That includes the defense department budget and off-budget emergency spending, and increases for the Department of Veterans Affairs. The Trump administration will set new records of defense spending. It is estimated to reach $989 billion. That adds spending for departments that support defense, such as Homeland Security, and the National Nuclear Security Administration. U.S. military spending is greater than those of the next 10 largest government expenditures combined. It's four times greater than China's military budget, and 10 times bigger than Russia's defense spending. It's difficult to reduce the budget deficit without cutting U.S. defense spending. Second is the impact of tax cuts. They immediately reduce revenue for each dollar cut. Proponents of supply-side economics argue that the government will recoup that loss over the long term by boosting economic growth and the tax base. But the National Bureau of Economic Research found that only 17% of the revenue from income tax cuts was regained. It also found that 50% of the revenue from corporate tax cuts was lost. For example, the Bush tax cuts added $2.023 trillion to the debt between 2011 and 2020. The Congressional Research Service estimated that service cost on that debt would add another $450 billion. Going forward, the Trump tax cut will reduce revenue. It's reducing the personal income tax rate, corporate taxes, and small business taxes. These cuts total $1.5 trillion over the next 10 years. But the Joint Committee on Taxation said the cuts would stimulate growth by 0.7 percent annually. The increased growth will add revenue, offsetting some of the tax cuts. As a result, the deficit will increase $1 trillion over the next decade. Lastly is unfunded elements of mandatory spending. Some people point to the $1 trillion cost of Social Security as a contributor to the deficit. But it's funded through payroll taxes and the Social Security Trust Fund until 2034. Medicare will cost $702 billion in FY 2020. But only 49% adds to the deficit. Payroll taxes and premiums pay for the remainder. The rest of the mandatory budget adds to the deficit. This includes Medicaid, which will be $426 billion in FY 2020. Medicaid provides health care to those with low incomes. The mandatory budget also includes $611 billion in income support programs for those who can't provide for themselves. This includes welfare programs like TANF, EITC, and Housing Assistance. It also includes unemployment benefits for those who were laid off. Student loans help create a more highly skilled workforce. Other retirement and disability programs are for those who were former federal employees. These include civil servants, the Coast Guard, and the military. Only an Act of Congress that amends a program's benefits can change mandatory spending. That would require a majority vote in both houses and is thus unlikely to happen. After the 2001 recession, federal deficits declined. The late 2006 recession drove deficits higher, with a deficit in 2009 driven up by more than $700 billion in bank bailouts under the TARP program. After the 2008 market crash, the federal deficit remained above $1 trillion until 2013. Below is a yearly breakdown of the federal budget deficit from 2007 to 2018. The difference between the U.S. government and you is that the president and Congress overspend on purpose. Politicians realize that, the more the government spends, the more it stimulates the economy. That's because government spending is itself a component of gross domestic product. They are rewarded by voters for creating jobs and growing the economy. They lose elections for raising taxes and unemployment. In the United States, corporations have gained the right to make donations for political advertising. They support the idea that tax cuts are the best way to create jobs. They convince people that trickle-down economics is a solution that works for everyone. As a result, politicians no longer seriously try to balance the budget. Most governments that consistently increase deficits are punished by investors. At some point, buyers of sovereign debt worry they won't get paid back. To compensate for that risk, they demand higher interest rates. That slows economic growth, creating an incentive to keep debt levels reasonable. The United States doesn't suffer from that problem. Other countries, such as China, are willing to buy Treasury notes. They receive hundreds of billions of U.S. dollars in exchange for exports. They must invest those dollars somewhere, and U.S. Treasurys are safe. Their high demand for Treasurys keeps interest rates low. As a result, Congress isn't burdened by punitive interest on the debt payments. A budget deficit is not an immediate crisis. In moderation, it increases economic growth. It puts money in the pockets of businesses and families. Their spending creates a stronger economy. That makes other countries happy to lend to the U.S. government. It has always paid the debt back. When the debt is excessive, owners of the debt become concerned. They worry that the United States won't pay them back. They had reason to be concerned in 2011 and 2013. That's when tea party Republican congressmen threatened to default on the U.S. debt. You should also be concerned when the economy is doing well. The government should be reducing the deficit in an effort to lower the debt. Deficit spending in a healthy economy will make it overheat. An economy that's churning too fast creates a boom and bust cycle. It always leads to a recession.